Brightly-painted letters and rims on its alphabet blocks are slightly raised to promote visual and tactile learning. The stickers on the spinners might wear and tear with time. Good for promoting basic learning skills. 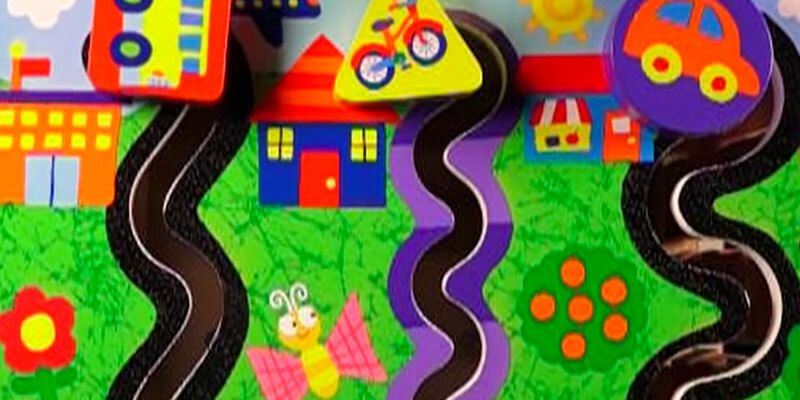 Its mini rollercoaster with beads of various colors and shapes, gears with cheerful stickers, and a pathfinder look compelling and are fun to play with. 7 cube faces with toys expand the number of games your child can play. For the size of the cube, its sides may seem a bit short. With so many toys in stock, the cube will bring a lot of joy and delight to your kids. Using butterflies, birds, and other cute little details as enhancing elements adds more appeal to the cube. It is a fantastic interactive toy with over 100 songs and phrases in stock. It will recognize the letter when you put an alphabet block in a special slot. Sometimes the blocks may get stuck in the peg maze. When you stack blocks on the top of the cube, it starts to reproduce different sounds and melodies. 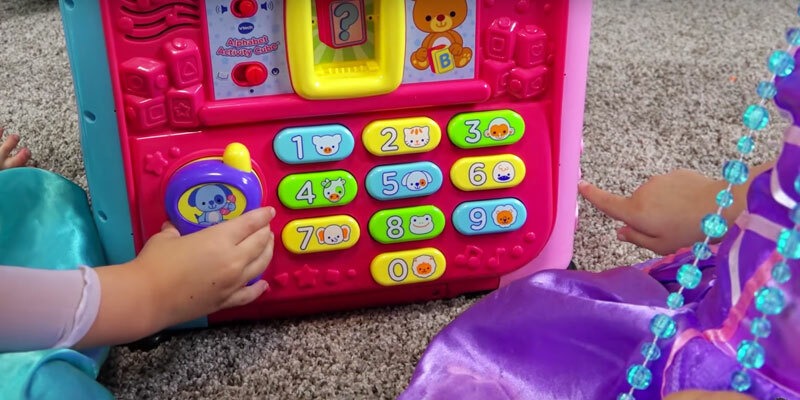 With so many interactive features to offer, the VTech activity cube is one of the best toys available to promote the cognitive development of children over 9 months old. The cube contains a lot of playful activities on 5 of its sides that will come to liking to children 1 year of age and older. A lot of the things are geared toward growing kids so your kid will always learn something new and develop new skills. There is no abacus. However, maze beads can be used for counting. Sturdy and durable, this wooden activity cube boasts a selection of toys to satisfy toddler's educational needs. A wonderful choice for developing basic skills of a kid over one year old! 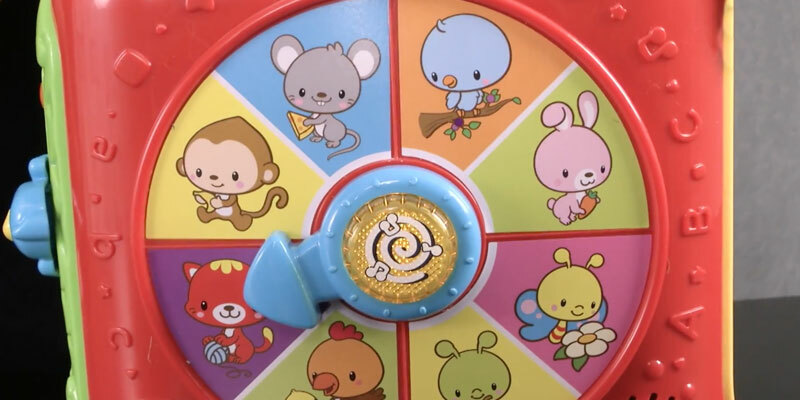 A delightful spinner on the top of the cube will let your kid learn many different animals, while the integrated book with the nursery rhymes will help him/her learn his/her first songs by heart. Some customers do not like the voices used. If you are looking for a travel size activity cube to keep your child busy wherever you go, here is the one to buy! Besides, it offers lots of engaging activities even if you turn the sound off. 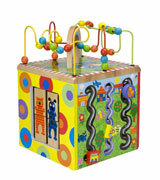 The Anatex play cube is recommended for kids over 2 years old, however, it will appeal to children of all ages. The engaging toys available will provide hours of fascinating play. 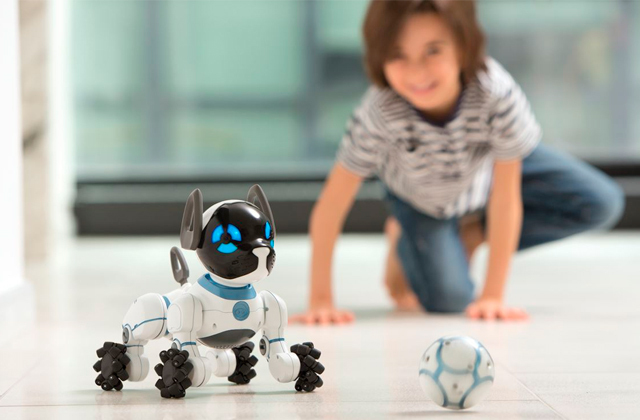 At the same time, they will also help improve visual tracking, fine motor, and other skills of your kid. On one of the cube sides, you will find wooden blocks with alphabet letters, numbers and colorful pictures. To make learning more exciting for your child, try naming things and animals out loud now and again. You will be impressed with the results! 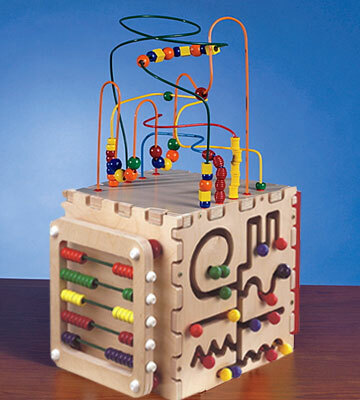 There's also an abacus in the cube that you can use to teach your kid color recognition before it's time to start with math. On the top of the cube, there's a mini roller coaster with dozens of beads of different shapes that move up and down a wire. As you can see, the Anatex Deluxe play cubes contains all the necessary features to promote and develop learning skills of your child. Your kid will love sliding colorful balls through the maze of paths in different trajectories: straight, curved, spiral, zigzag. This interesting solution will help your kid practice fine movements, as well as promote logic and hand-eye coordination. It's worth noting that this activity cube doesn't have any sharp edges and is absolutely safe for kids' use. 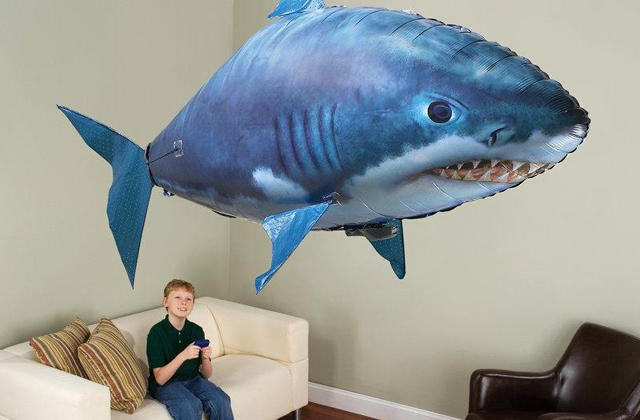 You can put it on any flat surface without worrying that it might hit your child and cause injuries. That the cube is not lightweight and made of solid wood is an advantage with respect to its stability. By spinning one of the gears, you can set all five wheels in motion and let your child watch a mesmerizing and enchanting beauty of rotating spirals. Your child will be eager to do the same himself/herself. 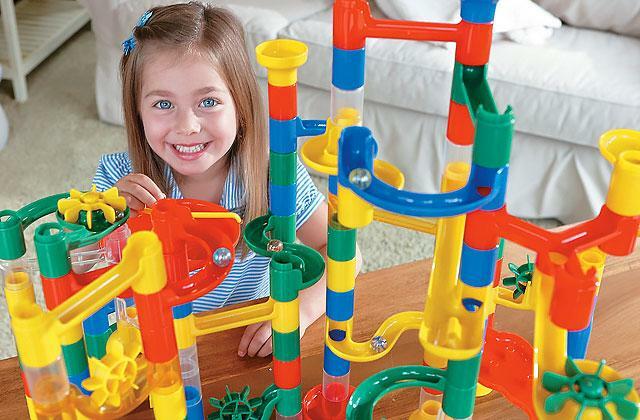 If you are interested in educational toys to promote logical thinking of children over 4 years, we also recommend you to read about marble runs. If you are looking for something more than a conventional play cube, this model is for you. The EverEarth EE33285 garden activity center has eight sides, seven of which provide different engaging toys to promote your child's learning skills through intriguing play. On the top of the cube, there's a classic maze with beads that move up and down the wires. 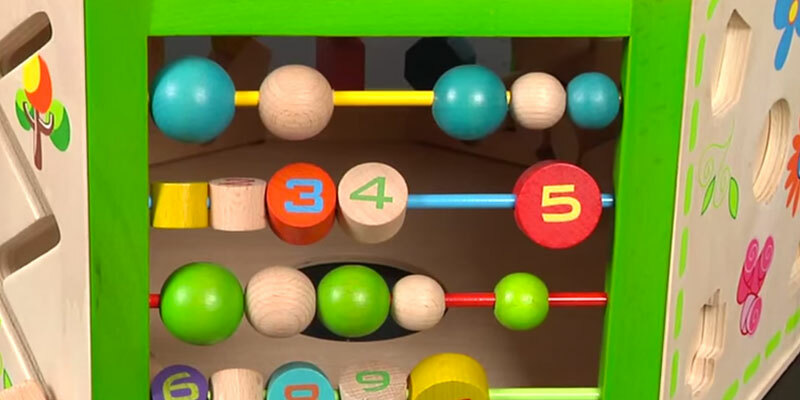 On the sides, you'll find two types of abacus: horizontal and vertical, each containing its unique interactive elements that will teach your kid his/her first math skills in an entertaining way. Using of the maze wire will help enhance your child's fine motor skills and hand-to-eye coordination. It's worth noting that the cube of this size will suit well families with two or more kids. 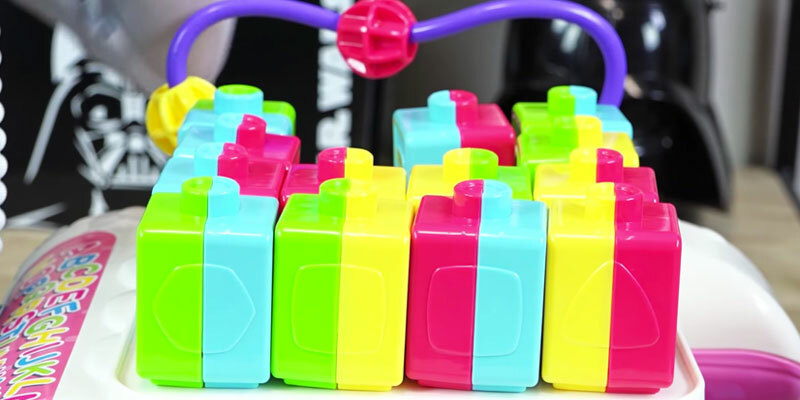 Just look at the elaborate design of this cube toy! All sides are embellished with lovely figures that cannot go unnoticed - a petite butterfly, snail, bee, bird, and a bug that "fly" and "crawl" along the paths of a blooming "garden" on the top. On one of the sides, you will find a tree with birds and butterflies which your kid can shake to create an illusion that the birds are flying. The pictures of cute little creatures and plants on wooden surfaces of the cube add more fun and appeal to the game. EverEarth company is famous for its high-quality and safe-to-use products, made from 100% FSC certified beech and painted with non-toxic water-based paint. Going the whole way to make our children's life better, the company also contributes to the preservation of our planet health. In 2011, they have started the "Plant-A-Tree" campaign to save woods, one of the greatest nature treasures. Every owner of an EverEarth product can register on the company's website for free and participate in the program. As a token of gratitude, the company will plant one more tree on its territory, once a new customer orders their toy. It is worth saying a few words about a shape sorter. There are little magnets built in each shape and each hole to hold the pieces in place. 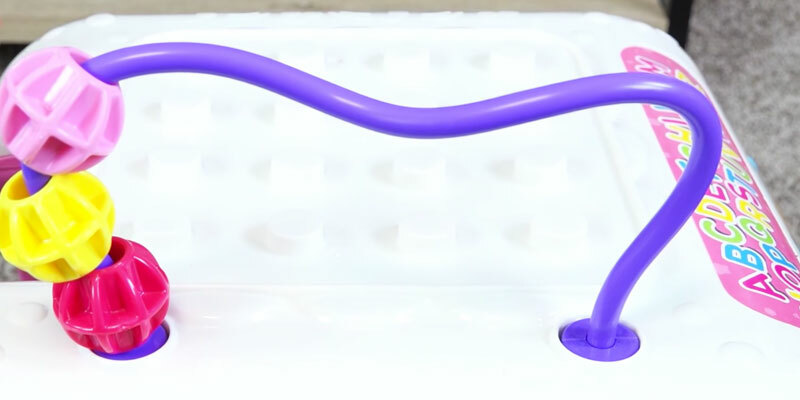 In addition to stability, this feature also makes this toy more attractive to kids who inherently love playing with magnets. If you are looking for more toys to promote your little learner' creativity, please, look through our wooden blocks review. Now let's pass on the VTech interactive play cube! Within the same price range, you'll hardly find a better cube with such a great number of engaging toys. Besides interactive features, your kid will have a chance to get engaged in many manual activities moving beads up and down the tracks, sliding little objects, opening and closing window shutters as well as turning gears. All these activities have educational benefits and can help your child enhance fine motor skills. What a great time your little one will have, looking at themselves in the mirror installed on the top of the cube in the form of the sun. 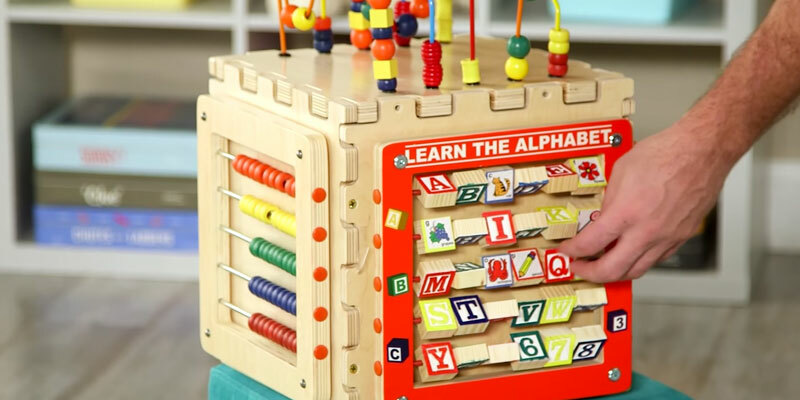 For enjoyable and effective learning, the manufacturer has included 13 double-sided alphabet blocks, allowing your child to familiarize with letters. Moreover, your young architect will be able to stack the blocks unit's top or use them for building castles. What is important, there is a storage for them inside the cube and several put-and-take holes on its side. This will help you teach your kid to keep his/her things in order. On the electronic side of the cube, you can see a selector that you can slide to either learning mode or a play mode position. 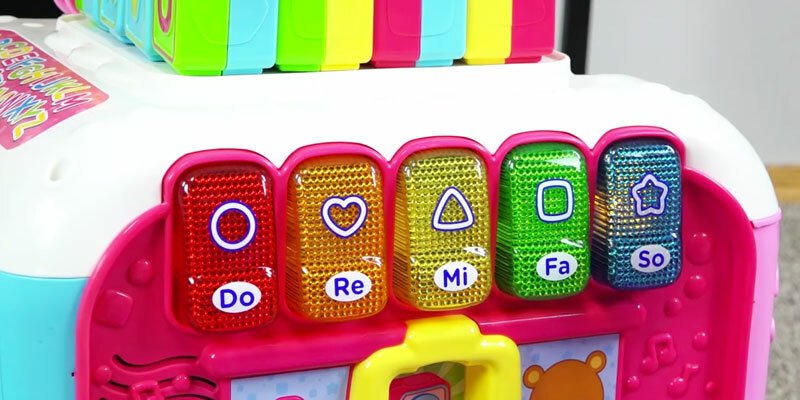 In the first mode, your kid will press piano keys and learn to recognize colors, shape, and animals, while in the second mode, he or she will actually hear the music. There's even a handset included that allows your kid to make phone calls. Like in many other activity cubes, this one has a block recognition area; once your child inserts a block in one of the slots, he/she will find out what letter's been hidden. 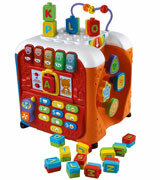 Add to amazing sound and light effects, and you'll clearly see how great this VTech cube really is. 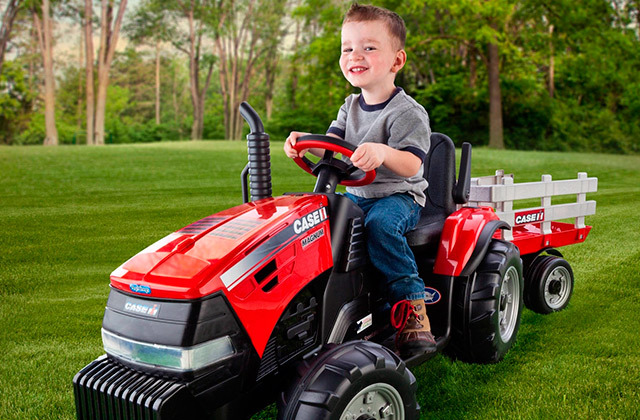 Your child will never get bored playing with it. Some people are rather skeptical about interactive toys and think them too noisy. 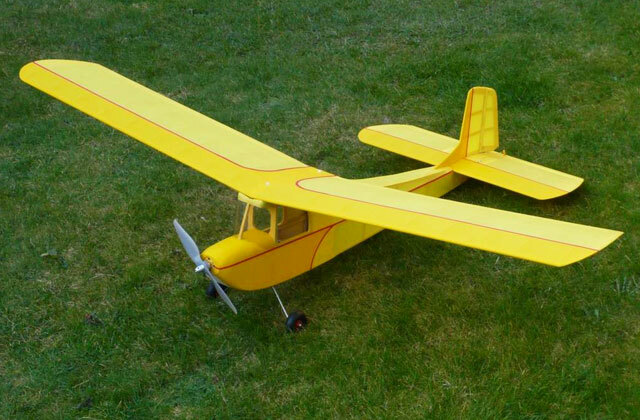 Luckily, the manufacturer of this model has done everything to make it a favorite toy of both a child and his/her parents. All the games are pretty quiet and it's possible to switch the sounds off. If your kid refuses to play in complete silence, turn the volume up a bit so that it doesn't disturb other family members. In order to save the battery life, the cube will automatically shut off after being not in use for longer than 45 seconds. The cube runs off 2 AA batteries (included) that according to the feedback last for a year or so before you need to replace them. 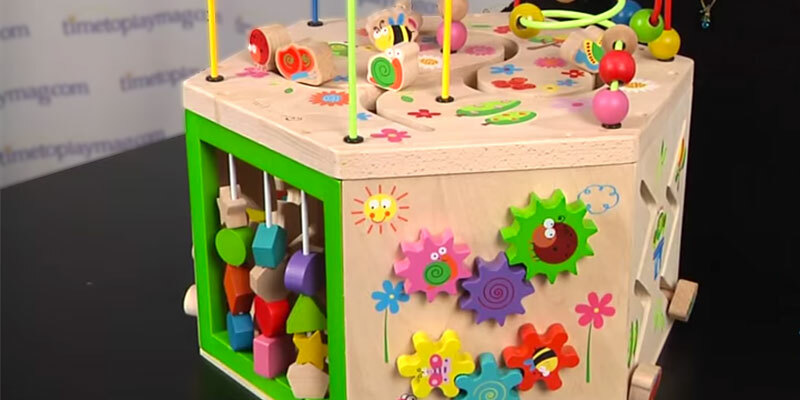 A cool thing about this interactive activity cube is that it provides up to 100 songs and phrases, including some really great and loved melodies of all times like, for example, "Three Little Kittens", "Mary Had a Little Lamb", "Twinkle Twinkle Little Star", and many others. To keep your little music lover entertained, consider buying one of these fantastic baby mobiles. Produced from solid wood, the ALEX Jr. My Busy Town activity cube will last for years to come. The cube contains all the features you'd expect from a developing toy: a curvy bead maze, racing car rollers, ABC tiles on horizontal wires. 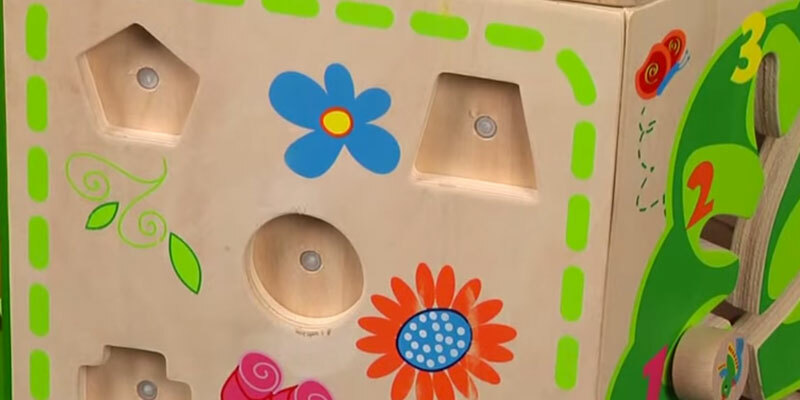 On one of the sides, you'll find a spin-and-match toy: two combinations of wooden blocks with pictures of animals on either side. By flipping these blocks, your kid will be able to match colorful lines of figures, improving his/her decision-solving skills. As we have already mentioned, there are wooden ABC tiles along the horizontal wires. Each side introduces the picture of either an animal or another object the name of which starts with the letter written on this title. Cheerful colors and jovial illustrations will help your tot learn the alphabet in fun way. What makes this toy stand out from its competitors is that it enables learning through a peek-a-boo game. 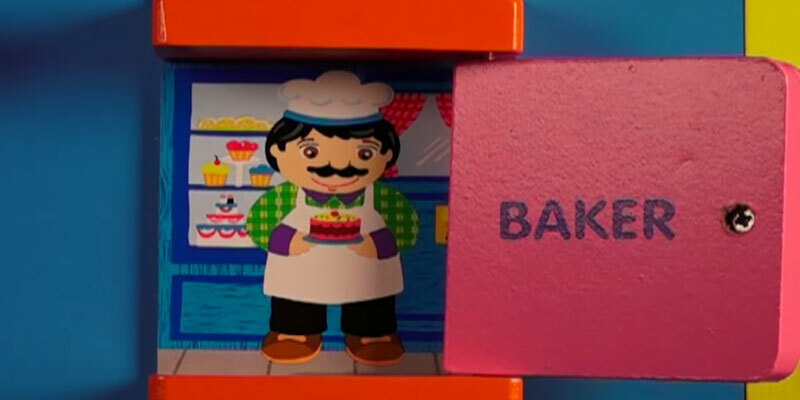 Take a look at the cube face with four doors, each bearing the picture of a person that stands behind it: a baker, a doctor, a mailman and a fireman. Not only can you use this toy to teach your kid colors, shapes and letters, it can also be used to learn some popular professions, including those written on the cube. Casting a look at the side with a maze wire, you will find many great winding tracks for car, bicycle, and bus races that your kid can use to either play alone or compete with his/her friends, moving tiny models of vehicles one by one down the tracks. This fun game helps promote hand-eye coordination and fine motor skills. Looking for an entertaining toy for your older child? 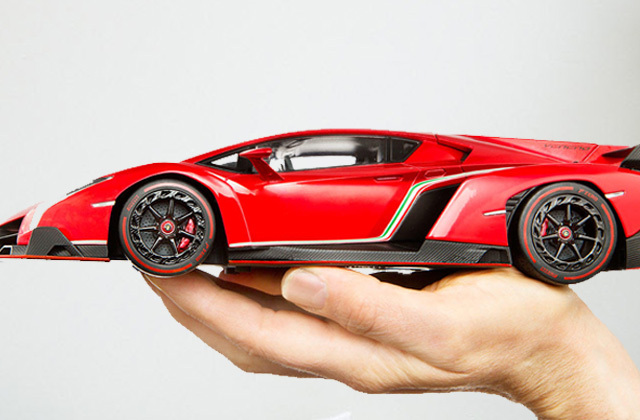 If your son or daughter loves fast-paced games, gift him/her a slot car track. The first thing you will notice right away when looking at the VTech Sort & Discover activity cube is an interactive and colorful spinner with a pointer at the top face of the cube. Turning this pointer towards the pictures of animals illustrated there, your kid will start to recognize them, while once he/she presses the yellow button, he/she will hear its name and the sounds it makes. 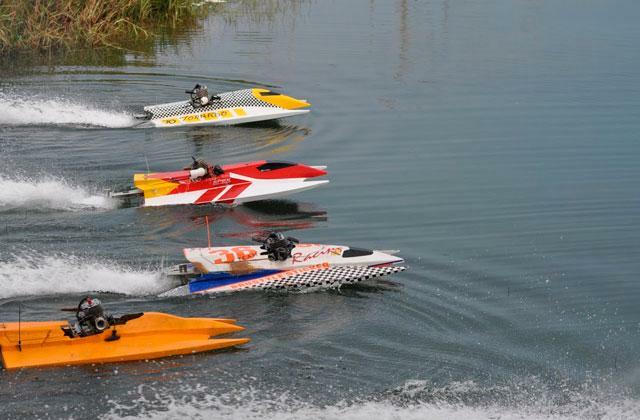 In addition, the cube offers a whole bunch of sliding, rolling and flipping activities. Here you will find all sorts of colorful beads and small-sized gears that once they touch one another start to spin, creating a captivating optical illusion effect. Not to mention a pretty little monkey that climbs up and down the trunk, a bird that flits about the treetops and fluttering butterflies! All these elements contribute greatly to the correct coordination of muscle and hand movements. One more welcoming feature of this model is a sorter with four shape blocks, easy for little fingers to grasp. Thanks to the storage inside the cube, all the little pieces can be neatly arranged, preventing the mess. 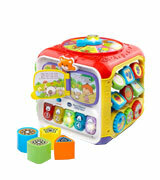 The VTech Sort & Discover is a wonderful play cube to familiarize your kid with musical instruments. Pressing the keys with pictures and numbers, your child will hear animal sounds, learn the numbers, and hear lots of merry tunes. 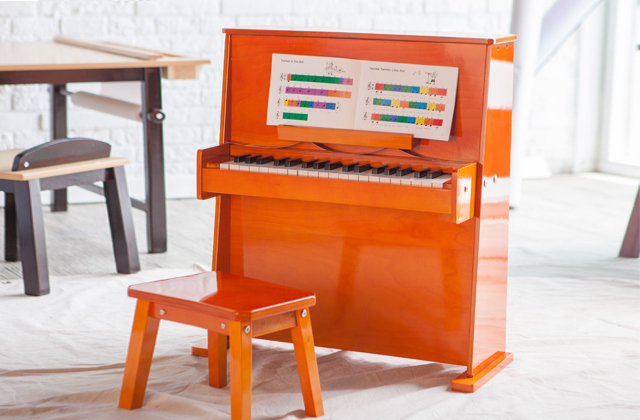 By switching to the piano mode, you can let your little one play the piano so he/she hears music instead of the sounds. 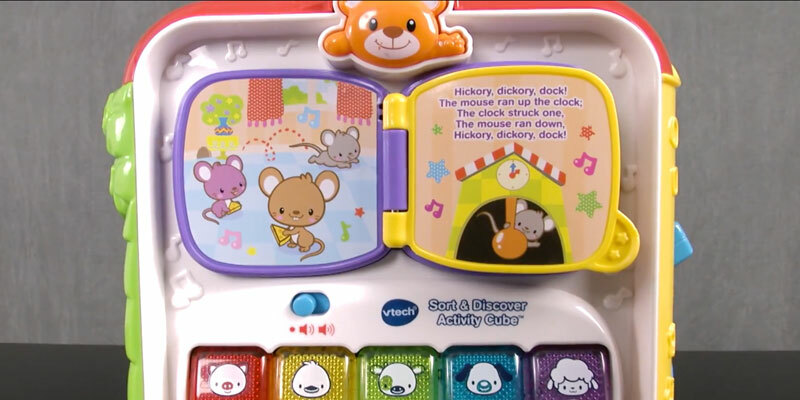 All in all, the VTech Sort & Discover activity cube can become a great toy to introduce your son or daughter to the world of music and animals and start to teach him/her letters, shapes and animals recognition at a very early age. They say that a book is the best present. Believe it or not, you will find one on the cube's panel. The book contains several pages easy for little fingers to turn over; either a "Hickory, Dickory, dock!" or "Mary had a little lamb" will start to play once your sweetie turns a page of the book. Would you like to activate more songs? Press a bear button above the book. Listening to these lovely melodies, your kid will develop sound perception and train his/her memory. What's also important (when buying music toys) is the option to mute the sound. 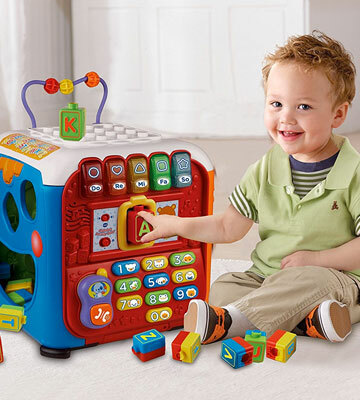 With the VTech Sort & Discover activity cube, this won't be a problem. All sounds can be turned off and activated on demand. The cube is powered by 2 AA batteries. Due to the compact dimensions, this cube will fit in any bag or storage basket of a stroller. Take it with you wherever your go and keep your little son or daughter entertained. 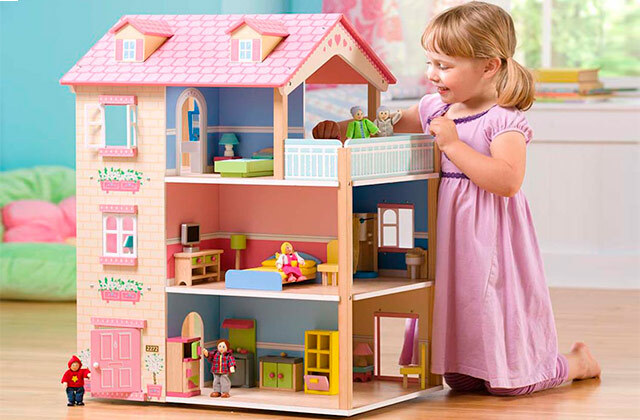 Today, you can find a wide range of engaging toys, intended to promote learning at each stage of child's development. To boost toddler's fine motor and cognitive skills, an activity cube is probably the best option. Designed as a cube or a figure with more than five sides, it has plenty of activities to offer, such as bead mazes, abacuses, sliders, sorters, etc. Interactive play cubes boast sound and visual effects to keep your tot busy and enhance his/her audio and visual perception and cognitive development. Most models include such elements as numbers and letters that help little children learn and recognize them and develop motor skills. You will not notice how quickly your kid will start to count and read first rhymes! 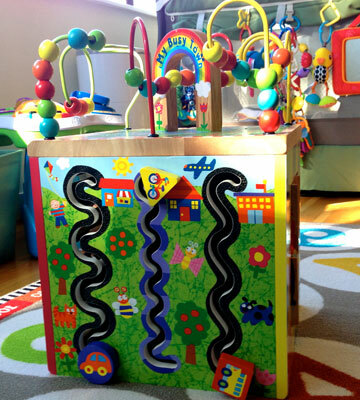 An excellent tool for stimulating infant's physical and mental development is a baby gym. If your tiny tot is about to make his or her first steps, we recommend you to get one of the baby walkers so he/she could move around safely while sitting in it. 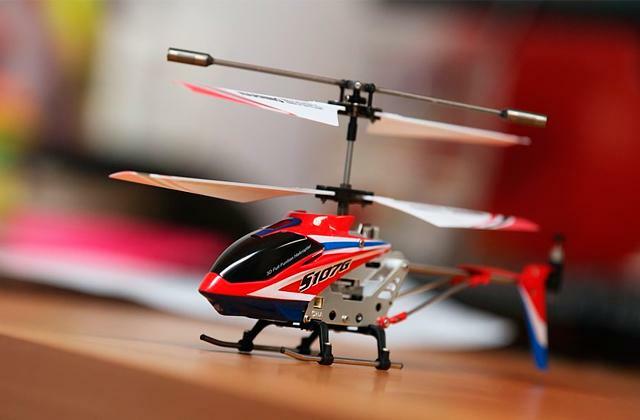 It is common knowledge that each toy works best at a particular stage of child's development; besides, it should comply with the corresponding safety standards for each age group. An activity cube has been designed for kids under 3 years old, hence, it is to be sturdy and durable, with all small parts properly fixed, and the edges well-rounded and polished. 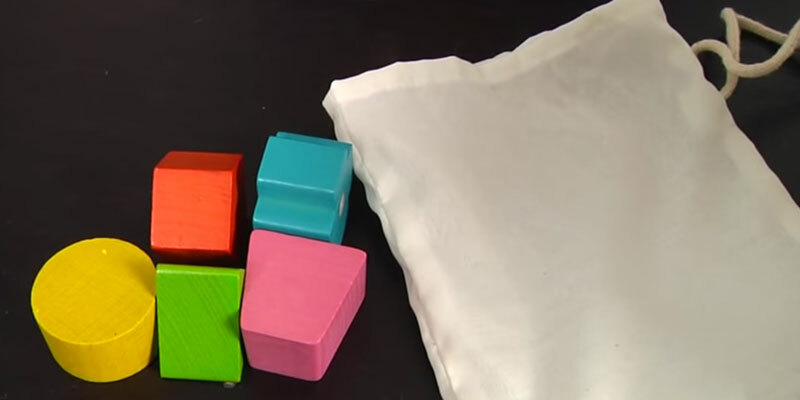 Infants get to know the world through tactile sense; after a while, they show curiosity in interactive toys with sound and visual effects before they finally get interested in more complicated tasks like learning letters and numbers. Manufacturers usually specify the recommended age on the package. Yet, you should also take in view the individual needs and skills of your own child. The toy should also include some of the engaging elements that would come useful at different development stages of your child. Luckily, most cubes contain a great number of interactive and learning activities that besides joy offer kids a nice and enjoyable way to develop new skills. 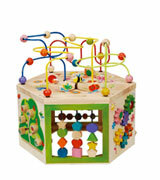 A classic wooden play cube has five surfaces with different toys on each of the sides. There are also larger models designed in the shape of hexahedrons that have more sides and playing activities. 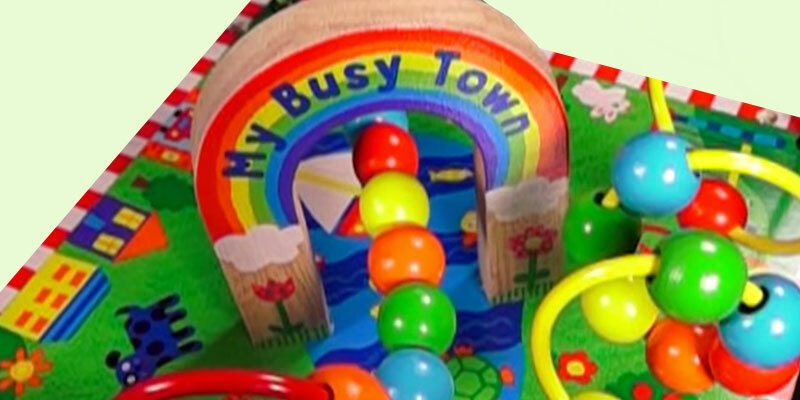 Each toy features a unique design that may resemble a little garden, town, castle, etc., and a bead maze on the top. Moving the beads up and down a wire, children enhance their fine motor skills and improve hand-eye coordination. Usually, activity cubes feature a pathfinder on one of the sides for promoting a child's logical thinking and engaging slides and spinning gears on the others. 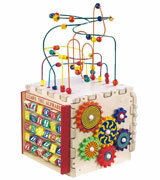 Some of them have a shape sorter that teaches problem-solving skills as well as color and shape recognition. You can find a lot of cubes with the alphabet and counting abacus; these are used for older kids to teach them pre-math and pre-reading skills. 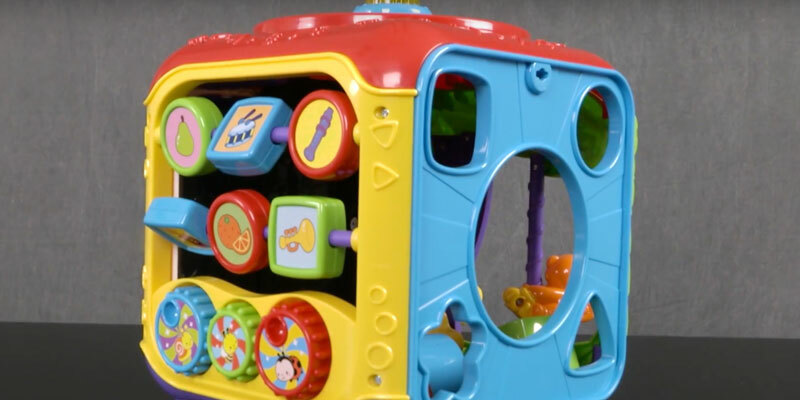 In addition to the above-listed teaching aids, interactive play cubes entertain children with various sound and visual effects, such as nursery songs, phrases, flashing lights, etc. If you do not mind these tunes playing now and again, there is hardly a better toy to gift your tot and keep him/her engaged. Quality materials are essential when it comes to selecting toys for babies as they tend to grasp and taste everything that gets in their way. 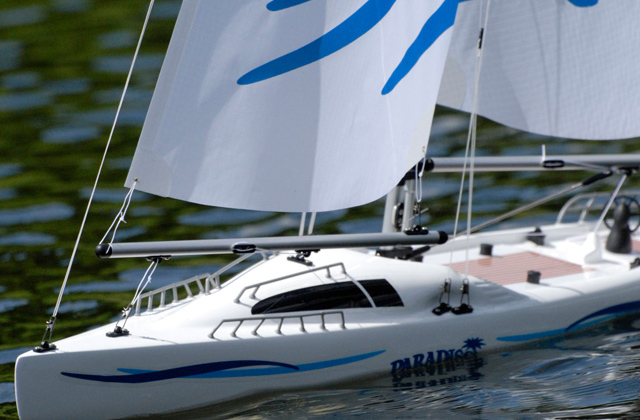 That is why it is advisable to choose a cube made of wood or high-quality plastic. As for the size of the cube, it should be sturdy enough to stay firmly in place so that it doesn't accidentally hit your kid while he/she plays with it. Q: How to pick the best play cube for my kid? A: First of all, consider the age specified by the manufacturer. Your kid might lose interest after a short while if the toy does not correspond to his/her developing stage. Next, think of your little ones' preferences. For example, some kids adore flowers and animals. They will be happy to flip blocks with pictures of funny little creatures and will surely love interactive play cubes that reproduce animal sounds. Children who love mazes will enjoy moving vibrantly colored beads up and down the wires, so a cube with a bead maze will be a better option for them. Q: Which cube to choose, wooden or interactive? A: A battery powered activity cube provides a great load of visual and sound effects to engage and keep your baby amused for hours. Those parents who don't like electronic toys and think them noisy should opt for wooden cubes that don't make any noises at all. Q: Can you adjust volume of an interactive cube toy? 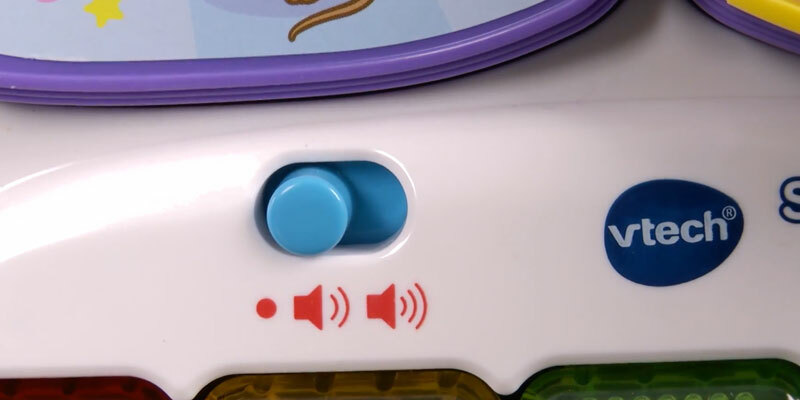 A: The manufacturers do their best to make their toys attractive to both kids and their parents, so the toys usually have a user-friendly switch, allowing you to turn the volume up/down. Q: How often do you need to replace batteries? A: Since most of the activity cubes automatically shut off when being not in use for a while, they don't drain batteries a lot. On average, standard batteries last for a year or so, depending on how often your kid plays with the cubes and activates the sounds. 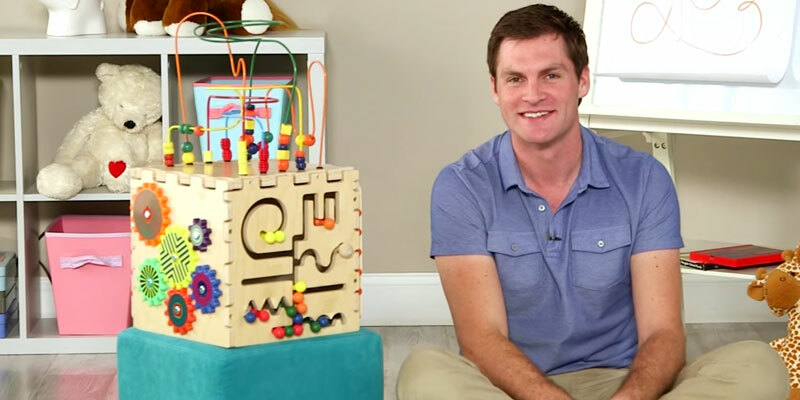 Q: Do I need a cube with an alphabet and abacus if my baby is only one year old? A: Play cubes are designed to provide developing activities for babies and toddlers. It'll be perfect to get a cube that will remain interesting for a growing child and offer him/her educational benefits and activities at different development stages. Besides, the alphabet can be used for learning animals and colors too. Q: Why should I buy an activity cube for my child? A: It is not a secret that children grow very fast and they need quality developing toys to satisfy their growing educational needs. Buying a play cube with a range of engaging toys will help boost your kid's fine motor and problem-solving skills, enhance his/her hand-eye coordination and promote the cognitive development. Q: Can it be used in waiting areas? A: Yes, it can! Toddlers and even older children love to play with activity cubes; it is a perfect toy to keep them busy for quite a long time and promote a cooperative play. 1. An age-by-age guide to buying toys, SheKnows. January 8, 2013. 2. Age-appropriate toys, BabyCenter. August 2016. 3. Infant cognitive development, Wikipedia. March 31, 2017. 4. Sara Peronto 10 Ways to Promote Your Child’s Cognitive Development, Friendship Circle. June 9, 2014. 5. Activities to Encourage Speech and Language Development, ASHA. 6. Amanda Lehrman 10 Activities to Improve Your Toddler's Development, Parents.com. 7. 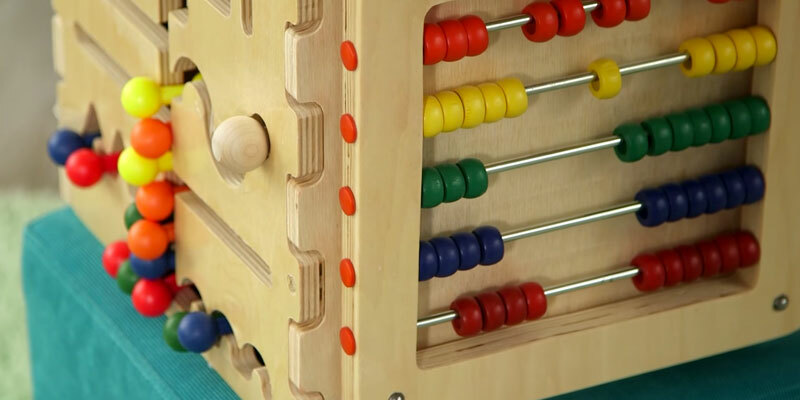 Help Your Toddler Breeze Through Maths With Abacus, Being The Parent.